-For point guards and shooting guards, it is beneficial for your offense to have players at those positions that can shoot threes effectively (however, there are some complications. Go to http://basketball-statistics.com/articles.html for more studies I did on point guards). -For small forwards, it is best to have a player closer to average (between 30% and 40%). 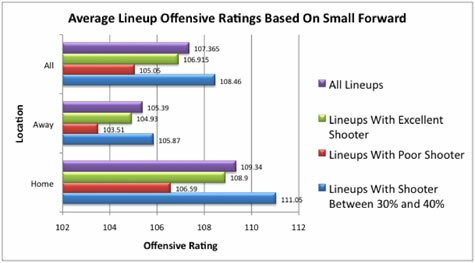 This may be the result of sharpshooting small forwards being specialists that are weak in other areas. -For power forwards, it all depends on the location. At home, it doesn’t matter how well he shoots threes. On the road, it’s great if he can shoot them at 28% or higher. -For centers, the answer remains unclear. There simply aren’t enough great shooting centers to reach a reasonable conclusion. 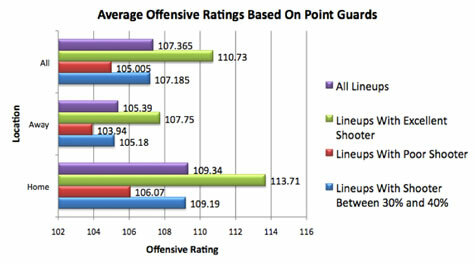 A second concern about my point guard study, besides the complications of true shot percentage, is the possibility that the relationship between three-point shooting in point guards and increased team Offensive Ratings is a matter of correlation and not causation. Perhaps, the theory goes, a point guard shoots a high percentage from long distance because the team is good at offense, rather than his three-point shooting being a reason why the offense is successful. As you can see, instead of using the cutoff points of 30% and 40%, I changed them to 32% and 38%. I did this because there are fewer players that have career percentages as extreme. 22.73% of home lineups featured a point guard with a career three-point percentage greater than 38%, and 33.95% featured a player with a percentage lower than 32%. 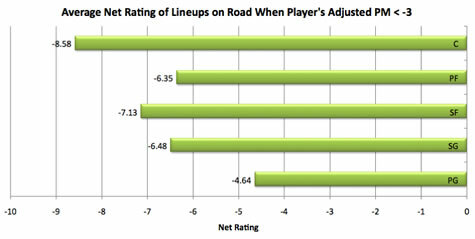 On the road, those numbers were 23.06% and 34.07%, respectively. The results are practically identical to those of the original study. I think we can safely say that using career three-point percentage instead of current percentage does not really make a difference.